an excellent quality Kingham mTm case. 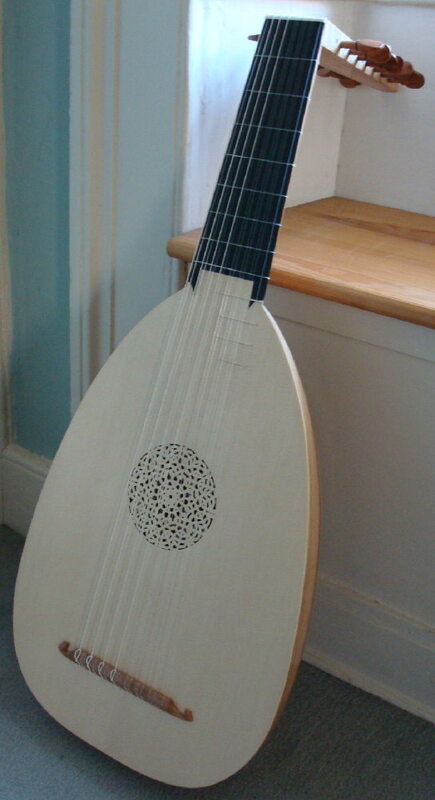 Twenty-first century lutes are for musicians who wish to play lute music composed from c. 1300 to 1680. Experienced lute players are very particular about using instruments appropriate for a period of music. Since lutes and lute music existed for such a long time, there are a wide variety of types of lutes. I have come to specialise in the lutes of the late Renaissance, but I make many other lutes as well. My lutes are based upon existing old instruments, paintings and contemporary evidence. All my lutes have Swiss pine soundboards and English fruitwood pegs. To keep cost to a minimum, these lutes have a slightly simplified rose, an oiled finish, no points where the soundboard meets the fingerboard, which is English walnut. I choose the materials, using what is available in the workshop, usually ash, English sycamore or cherry. None of these choices will effect the quality of the sound and the lute is very environmentally friendly. For a varnished finish add £350. Body of cherry, ash, sycamore, or contrasting sycamore and cherry with a small amount of decoration, lines between ribs, points where the soundboard meets the fingerboard, and a choice of more ornate roses. 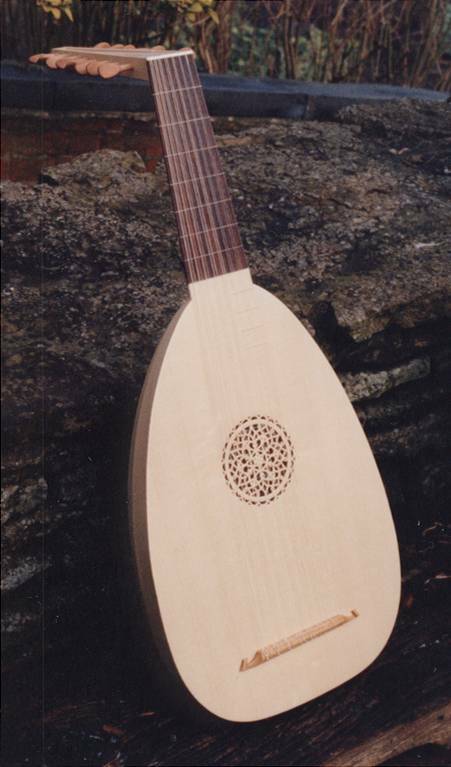 This design and level of decoration is typical of many late Renaissance lutes. 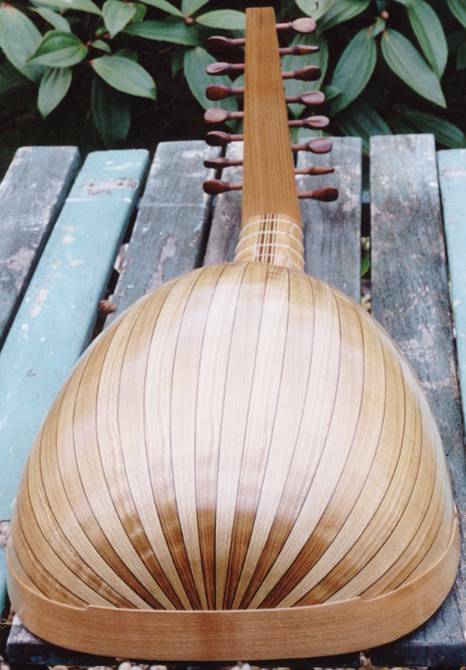 Two lute bodies made from 25 pieces of English cherry, one with light and one with dark dark lines between ribs. 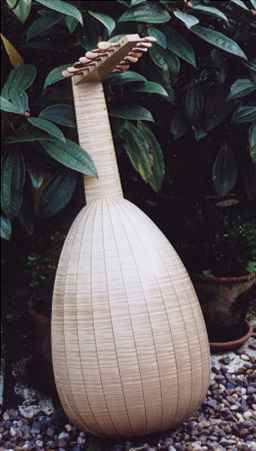 The neck, made of pine, is veneered with cherry that was used in the body. Again, some decoration. Ten course lutes are probably more popular today than they were in the 17th century. Two modern compromises are often made. The first is to increase the string length to about 630mm allowing longer bass strings which have a better tone. This also lowers the pitch of the top string to f'. The second is to make the neck a bit narrower so that some of the bass strings do not have the fingerboard beneath them. As these bass strings are never fretted, the fingerboard is not affected. The picture illustrates this. I can also make Baroque Lutes with more courses, viheulas and early guitars. I have made many types of musical instrument, classical, electric and steel string guitars, Appalachian dulcimer, octave mandola, psalteries, hammered dulcimer, santur (Persian Hammered dulcimer), Aeolian Harp and more. Prices for these projects vary, but a few guide prices (without cases) are below. 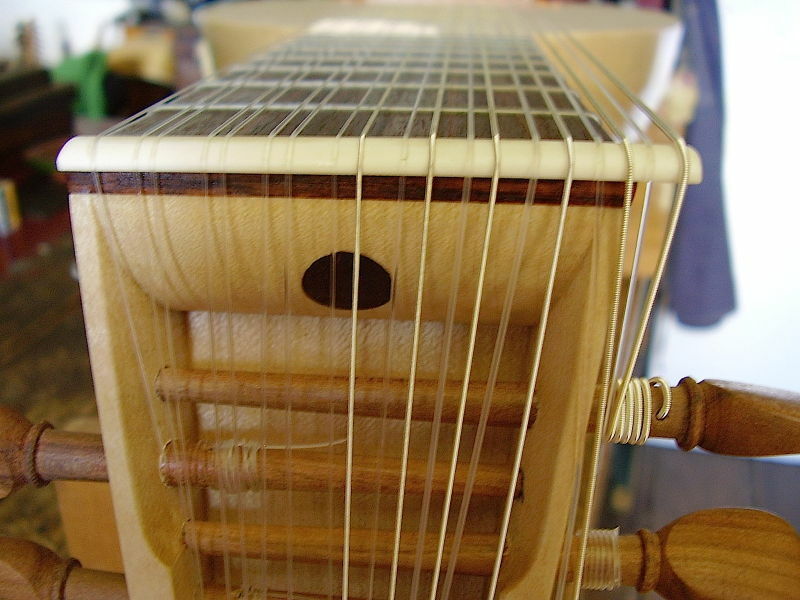 Appalchian dulcimer £1000, includes excellent quality planetary geared tuning machines. I have been making lutes since 1974 and I like to make them as if I were in the lute making environment of the 16th to 18th centuries. I use good quality materials, hide glue and have studied the old instruments. I do not copy existing old lutes but attempt to build instruments which could existed and are useful to modern players. 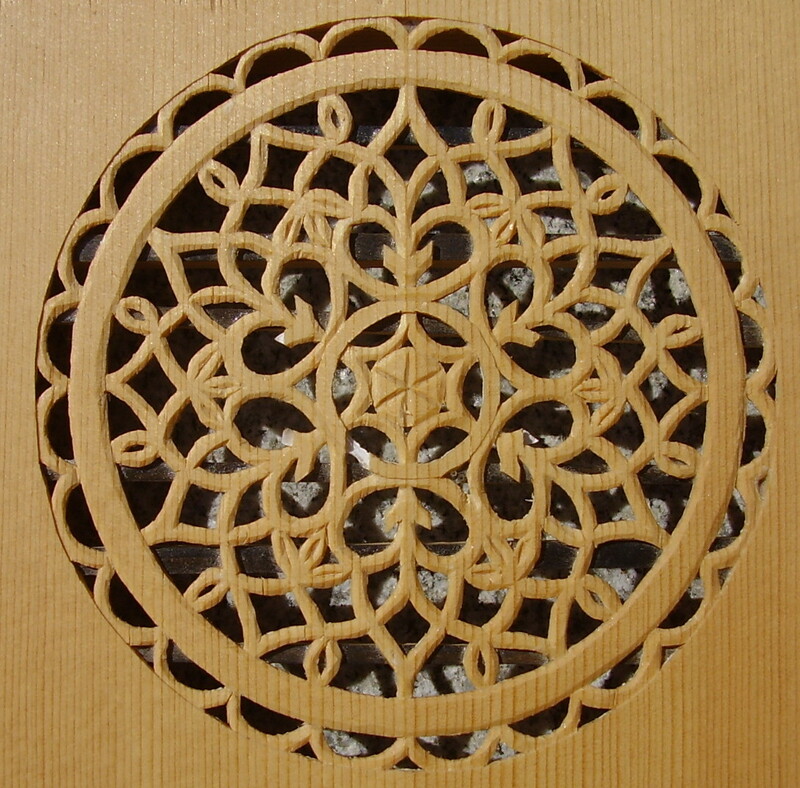 Lutes, and any other instrument from my workshop, are made entirely to customers specification. One of the pleasures of having a musical instrument made this way is that many choices are left to the player - tone, woods used, string length, string tension, use of gut or nylon strings, width of the nut, rose design, decoration. The most useful instruments originate from a working partnership between the player and maker. 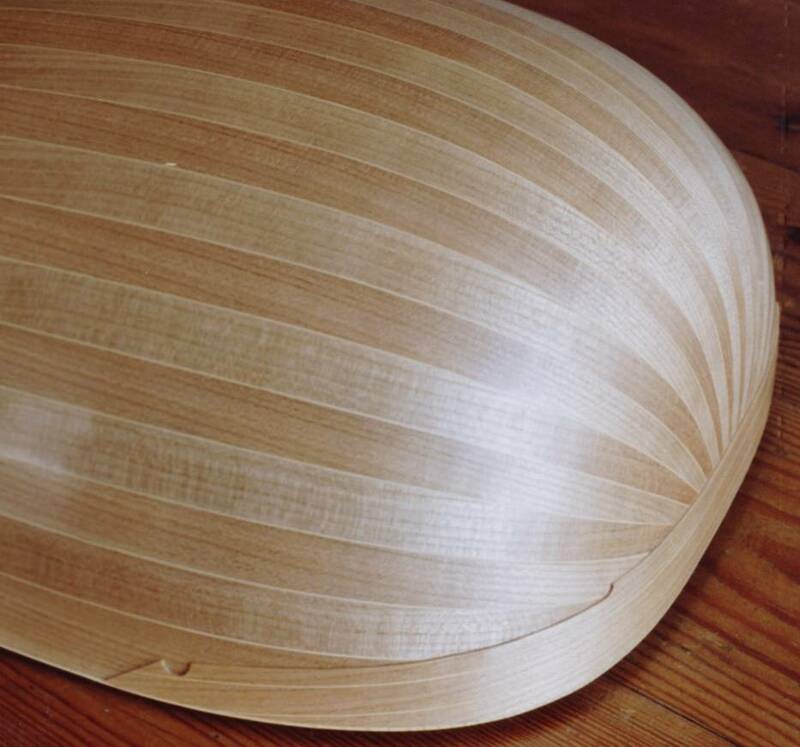 Soundboards (tops) are made from best quality 'Swiss Pine' (Picea abies). In my opinion, this is the only wood which works for lutes. The tree grows all over Europe, but only in certain localities can it be harvested for musical instrument making. Plantations in the Alps have been in existence for centuries and it is reported that these plantations are being well managed. 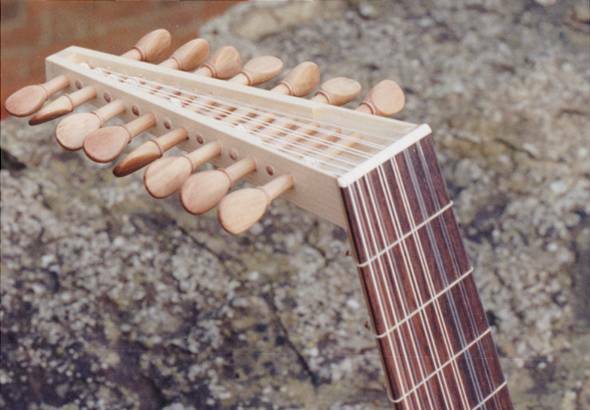 For the remainder of the lute, I use native English timber; sycamore, maple, cherry, walnut, ash, apple, pear, plum etc. They are all beautiful woods, relatively inexpensive and locally available. I air dry these woods myself, exactly as the old lute makers would have done. I don't use much exotic timber (tropical hardwoods). Fingerboards have always been a problem. It was difficult to find wood hard enough but no an endangered species. I have used bog oak - black, hard and 10,000 years old. Recently Forest Stewardship Council approved African blackwood has become available and I will now use that. I do not intend to buy any ebony. I have more rosewood, enough for quite a few fingerboards and one baroque lute. Since the beginning of 2017 all species of rosewood are now subject to CITES restrictions. There is no ivory, whalebone or Brazilian rosewood in my instruments, though I did recently use some very old ivory (obtained from a harpsichord restorer) for replacing missing 18th century ivory an English Guittar restoration. In short, my instruments are authentically and responsibly constructed, and very playable. At the moment the waiting list is about six months and I ask a non-refundable deposit of about 15% to confirm an order.